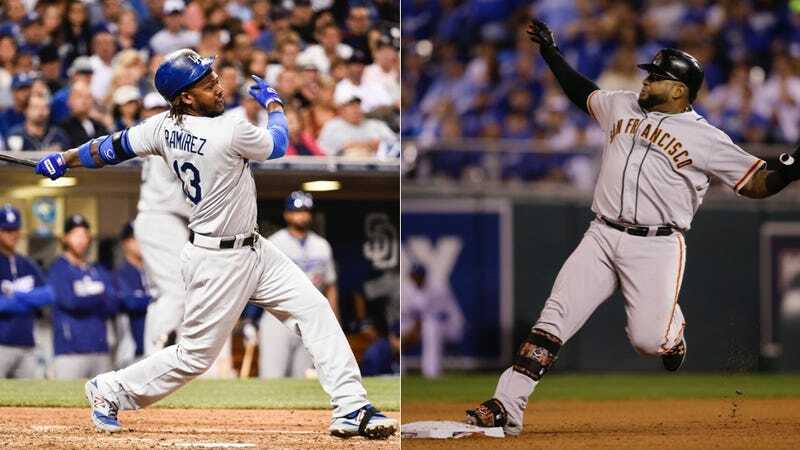 It appears the Red Sox will not content themselves with just one premier free agent signing; credible reports have Boston inking both Hanley Ramirez and Pablo Sandoval to five-year deals, to be finalized as early as today. The first report comes from Fox Sports' Ken Rosenthal, who says that Ramirez will get five years and roughly $90 million from Boston. It'll be a homecoming of sorts for Ramirez, who came up through the Red Sox system before being sent to the Marlins as part of the deal that brought Josh Beckett to Boston. The Sandoval signing is a little trickier. CBS's Jon Heyman says it's all agreed upon—five years and nearly $100 million. But multiple other reporters are claiming the deal isn't done, which might just be a function of the contract process—or of which side of negotiations Heyman's sources are on. With Sandoval, 28, slotting in at third base, there's a question of where Ramirez will play. He's a shortstop by trade, with some experience at third, but the Red Sox seem (wisely) intent on handing the shortstop position to Xander Bogaerts. Though Boston has a glut of outfielders, you can probably expect Ramirez, 30, to play left field.